US fallacies may be leading to war with Russia. —Finally, the new cold war may be more perilous because, also unlike during its forty-year predecessor, there is no effective American opposition—not in the administration, Congress, establishment media, universities, think tanks, or in society. In this regard, we need to understand our plight. We—opponents of the US policies that have contributed so woefully to the current crisis—are few in number, without influential supporters and unorganized. I am old enough to know our position was very different in the 1970s and 1980s, when we struggled for what was then called détente. We were a minority, but a substantial minority with allies in high places, even in Congress and in the State Department. Our views were solicited by mainstream newspapers, television and radio. In addition to grassroots support, we even had our own lobby organization in Washington, the American Committee on East-West Accord, whose board included corporate CEOs, political figures, prominent academics, and statesmen of the stature of George Kennan. About my episodic participation in the very limited mainstream media discussion I will speak in a more personal way than I usually do. From the outset, I saw my role as twofold. Recalling the American adage, “There are two sides to every story,” I have sought to explain Moscow’s view of the Ukrainian crisis, which is almost entirely missing in mainstream coverage. (Without David Johnson’s indispensable daily Russia List, non-Russian readers would have little access to alternative perspectives.) What, for example, did Putin mean when he said Western policy-makers were “trying to drive us into some kind of corner,” “have lied to us many times” and in Ukraine “have crossed the line”? Second, having argued since the 1990s that Washington’s bipartisan Russia policies could lead to a new cold war and to just such a crisis—see my articles in The Nation and my books Failed Crusade and Soviet Fates and Lost Alternatives—I wanted to bring my longstanding analysis to bear on today’s crisis. —None of these character assassins present any factual refutations of anything I have written or said. They indulge only in ad hominem slurs based on distortions and on the general premise that any American who seeks to understand Moscow’s perspectives is a “Putin apologist” and thus unpatriotic. Such a premise only abets the possibility of war. —Some of these writers, or people who stand behind them, are longtime proponents of the twenty-year US policies that have led to the Ukrainian crisis. By defaming us, they seek to obscure their complicity in the unfolding disaster and their unwillingness to rethink it. Failure to rethink dooms us to the worst outcome. —Equally important, however, these kinds of neo-McCarthyites are trying to stifle democratic debate by stigmatizing us in ways that make us unwelcome on mainstream broadcasts and op-ed pages, and to policy-makers. They are largely succeeding. Let us be clear. This means that we, not the people on the left and right who defame us, are the true American democrats and the real patriots of US national security. We do not seek to ostracize or silence the new cold warriors but to engage them in public debate. And we, not they, understand that current US policy may have catastrophic consequences for international and American security. The perils and costs of another prolonged cold war will afflict our children and grandchildren. If nothing else, this reckless policy, couched even at high levels in relentless demonizing of Putin, is already costing Washington an essential partner in the Kremlin in vital areas of US security—from Iran, Syria and Afghanistan to efforts to counter nuclear proliferation and international terrorism. Finally, in connection with our struggle for a wiser American policy, I have come to another conclusion. Most of us were taught that moderation in thought and speech is always the best principle. But in a fateful crisis such as the one now confronting us, moderation for its own sake is no virtue. It becomes conformism, and conformism becomes complicity. I recall this issue being discussed long ago in a very different context—by Soviet-era dissidents when I lived among them in Moscow in the 1970s and 1980s. A few of our supporters who know that history (including Edward Lozansky, a former Soviet dissident, Reagan Republican, and the organizer of today’s event) have recently called us “American dissidents.” The analogy is imperfect: my Soviet friends had far fewer possibilities for dissent and risked much worse consequences. But the analogy does suggest a lesson. Soviet dissidents were protesting an entrenched orthodoxy of dogmas and uncritical policy-making, which is why they were denounced as heretics by Soviet authorities and media. Since the 1990s, beginning with the Clinton administration, exceedingly unwise notions about post-Soviet Russia and the political correctness of US policy have congealed into a bipartisan American orthodoxy. The natural, historical response to orthodoxy is heresy. So let us be patriotic heretics, regardless of personal consequences, in the hope that many others will join us, as has often happened in history. —Fallacy No. 1: Ever since the end of the Soviet Union in 1991, Washington has treated post-Communist Russia generously as a desired friend and partner, making every effort to help it become a democratic, prosperous member of the Western system of international security. Unwilling or unable, Russia rejected this American altruism, emphatically under Putin. —Fallacy No. 2: There exists a nation called “Ukraine” and a “Ukrainian people” who yearn to escape centuries of Russian influence and to join the West. Fact: As every informed person knows, Ukraine is a country long divided by ethnic, linguistic, religious, cultural, economic and political differences—particularly its western and eastern regions, but not only. When the current crisis began in 2013, Ukraine had one state, but it was not a single people or a united nation. Some of these divisions were made worse after 1991 by corrupt elite, but most of them had developed over centuries. —Fallacy No. 3: In November 2013, the European Union, backed by Washington, offered Ukraine’s President Viktor Yanukovych a benign association with European democracy prosperity. Yanukovych was prepared to sign the agreement, but Putin bullied and bribed him into rejecting it. Thus began Kiev’s Maidan protests and all that has since followed. Fact: The EU proposal was a reckless provocation compelling the democratically elected president of a deeply divided country to choose between Russia and the West. So too was the EU’s rejection of Putin’s counter-proposal of a Russian-European-American plan to save Ukraine from financial collapse. On its own, the EU proposal was not economically feasible. Offering little financial assistance, it required the Ukrainian government to enact harsh austerity measures and to sharply curtail is longstanding economic relations with Russia. Nor was the EU proposal entirely benign. It included protocols requiring Ukraine to adhere to Europe’s “military and security” policies, which meant in effect, without mentioning the alliance, NATO. In short, it was not Putin’s alleged “aggression” that initiated today’s crisis but instead a kind of velvet aggression by Brussels and Washington to bring all of Ukraine into the West, including (in the fine print) into NATO. —Fallacy No. 4: Today’s unfolding civil war in Ukraine was caused by Putin’s aggressive response to Maidan’s peaceful protests against Yanukovych’s decision. Fact: In February 2014, radicalized Maidan protests, strongly influenced by extreme nationalist and even semi-fascist street forces, turned violent. Hoping for a peaceful resolution, European foreign ministers brokered a compromise between Maidan’s parliamentary representatives and Yanukovych. It would have left him as president of a coalition, reconciliation government until new elections in December 2014. Within hours, violent street fighters aborted the agreement. Europe and Washington did not defend their own diplomatic accord. Yanukovych fled to Russia. Minority parliamentary parties representing Maidan and predominantly western Ukraine, among them Svoboda, an ultra-nationalist movement previously anathematized by the European Parliament as incompatible with European values, formed a new government. They also nullified the existing constitution. Washington and Brussels endorsed the coup, and have supported the outcome ever since. Everything that followed, from Russia’s annexation of Crimea and the spread of rebellion in southeastern Ukraine to the civil war and Kiev’s “anti-terrorist operation,” was triggered by the February coup. Putin’s actions have been mostly reactive. —Fallacy No. 5: The only way out of the crisis is for Putin to end his “aggression” and call off his agents in southeastern Ukraine. Fact: The underlying causes of the crisis are Ukraine’s own internal divisions, not primarily Putin’s actions. The primary factor escalating the crisis since May has been Kiev’s “anti-terrorist” military campaign against its own citizens, now mainly in the Donbass cities of Luhansk and Donetsk. Putin influences and no doubt aids the Donbass “self-defenders.” Considering the pressure on him in Moscow, he is likely to continue to do so, perhaps even more, but he does not control them. If Kiev’s assault ends, Putin probably can compel the rebels to negotiate. But only the Obama administration can compel Kiev to stop, and it has not done so. 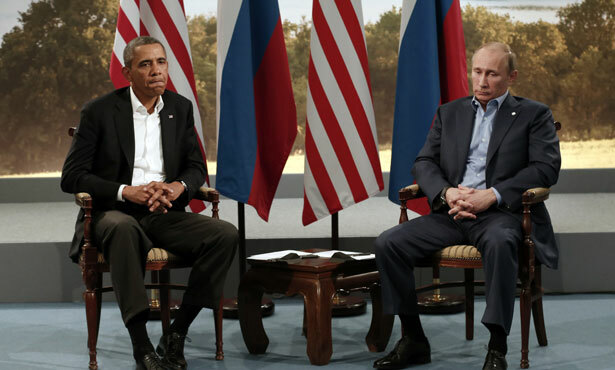 In short, twenty years of US policy have led to this fateful American-Russian confrontation. Putin may have contributed to it along the way, but his role during his fourteen years in power has been almost entirely reactive—indeed, a complaint frequently lodged against him by hawks in Moscow. —The civil war escalates and widens, drawing in Russian and possibly NATO military forces. This would be the worst outcome: a kind of latter-day Cuban missile crisis. —Today’s de facto partitioning of Ukraine becomes institutionalized in the form of two Ukrainian states—one allied with the West, the other with Russia—co-existing between cold war and cold peace. This would not be the best outcome, but nor would it be the worst. —The best outcome would be the preservation of a united Ukraine with one state. This will require good-faith negotiations between representatives of all of Ukraine’s regions, including leaders of the rebellious southeast, probably under the auspices of Washington, Moscow and the European Union, as Putin and his foreign minister, Sergei Lavrow, have proposed for months. —Ukraine must be governed in ways that enable it to maintain or develop economic relations both with Russia and the West. Otherwise, it will never be politically independent or economically prosperous. —If these principles are adopted, they should be guaranteed, along with Ukraine’s present territorial integrity, by Russia and the West, perhaps in a UN Security Council resolution. But such negotiations cannot even begin until Kiev’s military assault on eastern Ukraine ends. Russia, Germany and France have repeatedly called for a cease-fire, but the “anti-terrorist operation” can end only where it began—in Kiev and Washington. Alas, there is no such leadership here in Washington. President Obama has vanished as a statesman in the Ukrainian crisis. Secretary of State John Kerry speaks publicly more like a secretary of war than as our top diplomat. The Senate is preparing even more warfare legislation. The establishment media relies uncritically on Kiev’s propaganda and cheerleads for its policies. Unlike the devastation wrought in Gaza, American television rarely, if ever, shows Kiev’s destruction of Luhansk, Donetsk or other Ukrainian cities, thereby arousing no public qualms or questions. Stephen F. Cohen is Professor Emeritus of Russian Studies and Politics at New York University and Princeton University. A Nation contributing editor, his most recent books, now in paperback, are Soviet Fates and Lost Alternatives: From Stalinism to the New Cold War; and The Victims Return: Survivors of the Gulag After Stalin.